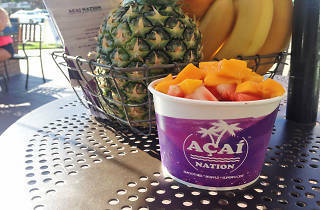 Nestled into a small strip mall in Brentwood is Açai Nation, a smoothie and açai bowl shop where surfboards hang from the walls and fake grass lines the floor. An enthusiastic employee will happily walk you through both the most popular items and her own personal favorites, but there's plenty to choose from either way. The list of bowls range from a classic mix of açai, fruit, coconut flakes and granola to ones feature cocoa flakes and chia seeds (customized bowls are also available). They're generous with fruit here, and a hefty selection of granola to choose from is a nice touch. Also a nice touch: the '90s jams playing in the background while you dig into your bowl on the outdoor patio. 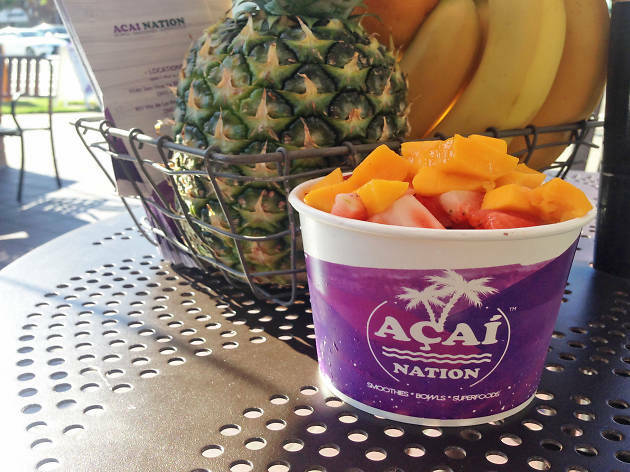 The açai is a tad sweeter than some other picks in town, but it's still undeniably fresh, smooth and indulgent—and with Usher crooning in the background, we're already sold.